Custom-built entertainment centers made in Boston, MA. 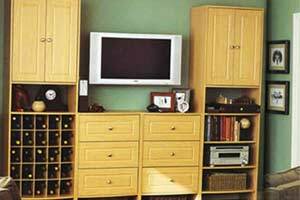 Our designs can include custom DVD & CD shelving, storage cabinets and more. The living room is where your family spends a large amount of their time and where you entertain guests, so you want the room to look good. 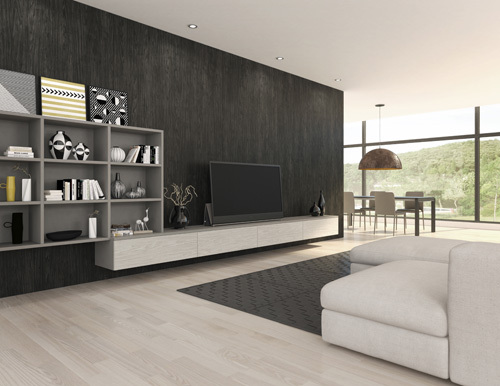 A custom entertainment center can make a world of difference to the room’s overall appearance. Whether you have one of those cookie-cutter entertainment centers, or a DVD and cable box balanced precariously on top of your television, the Boston Closet Company has a solution that will fit your TV, stereo system and other equipment perfectly. We can devise a solution that will not only make the room look orderly but help improve the function of your entertainment center. You’ll be able to hide all those unsightly cords and provide extra storage space for your CDs, DVDs, books and games and anything else that comes to mind. After all, the more organized your home entertainment unit, the easier it will be for you to relax and enjoy it. Whether you are looking for a wall-to-wall unit, or a smaller solution to fit into a specific area, the Boston Closet Company can help. We specialize in home storage solutions, and entertainment centers are no exception. During a free, no-obligation consultation, you and one of our professional designers can discuss storage solutions for your custom entertainment center. From your TV to your Nintendo Wii, your designer will take all the measurements necessary to ensure that everything fits just right into your brand-new unit. Not only are our prices unbeatable, but our designers are skilled, professional and always on time for appointments. Contact us today for your FREE custom entertainment center consultation.